WrestleMania 35 broke the record for MetLife Stadium’s highest-grossing entertainment event at $16.9 million. Aaron Holland, Jon Rappaport and Robert Beadle, Season Share co-founders using technology technology in the season ticket market. Season Share is a platform that allows for fractional ownership of season tickets, a practice long used by friends to make a significant time and money investment worthwhile. The WNBA is getting a fresh look. Rolling out in conjunction with tomorrow’s WNBA draft, the brand “refresh” includes a new logo design. AT&T becomes the first non-apparel partner to have its logo featured on the front of all 12 WNBA team jerseys throughout the league. NASCAR is falling on hard times. Bristol Motor Speedway saw between 35,000 – 45,000 fans in attendance at the 162,000-seat track. Michael Avenatti after being arrested on charges of extortion was back on Twitter this past weekend with documents that he alleges show that Nike bribed basketball players. The Trump administration nullified Major League Baseball’s historic agreement with the Cuban Baseball Federation. In December Cuban citizens could play Major League Baseball without being forced to defect. The Obama administration rule allowed major league baseball to pay the Cuban Baseball Federation a release fee equal to 25 percent of each Cuban player’s signing bonus.This deal is similar to ones that MLB has with leagues in China, South Korea, and Japan. Texas Tech Red Raiders vs Virginia Cavaliers Game Highlights. March Madness – National Championship. Jay Bilas, Jay Williams, Seth Greenberg, and Rece Davis breakdown the Virginia Cavaliers’ overtime win over the Texas Tech Red Raiders saying Virginia’s big three of De’Andre Hunter, Kyle Guy and Ty Jerome came up huge and their defense got stops when it mattered most. The Cavaliers win their first basketball national championship in school history. Stephen A. Smith, Max Kellerman and Jay Williams dissect the controversial replay review that gave the ball back to Virginia in the closing minutes of overtime against Texas Tech, setting up the Cavaliers to clinch the 2019 NCAA national championship game. Stephen A. says the referees didn’t get the call correct, but Max and Jay agree they definitely got the call right. Press Conference from the Virginia Texas Tech Championship Game 2019. The University of Virginia beat Texas Tech 85-77 in overtime to win the Final Four NCAA college basketball tournament on Monday evening at U.S. Bank Stadium in Minneapolis (top right) In 2018, Virginia became the first top seed to lose to a No. 16 seed – University of Maryland-Baltimore County – in the first round. Students poured onto the court after the final buzzer while spectators in Richmond, Va partied in the streets (left and bottom right). Videos on social media captured the celebrations from both the team and their fans after the win. Virginia’s Kyle Guy and Tony Bennett reflect on the team’s resilience after losing in the first round last season and how that motivated them to come back and win the championship. Rachel Nichols, Ramona Shelburne and Amin Elhassan of The Jump talk about the issues with the Los Angeles Lakers as the 2018-19 NBA season comes to a close with LeBron James & Co. missing the playoffs. Shelburne breaks the news that president Magic Johnson and coach Luke Walton haven’t spoken in weeks. Stephen A. Smith and Max Kellerman assess the recent GOAT vote by current NBA players. Max and Stephen A. agree Michael Jordan received too many votes while Kareem Abdul-Jabaar, LeBron James and Larry Bird may have gotten snubbed. NBA player poll: Westbrook ties Draymond for most overrated in league. In her daily monologue, Rachel Nichols of The Jump talks about the Denver Nuggets appearing to tank a game vs. the Portland Trail Blazers, perhaps in an attempt to avoid the Houston Rockets in the second round of the 2019 NBA playoffs. Nichols, Kevin Arnovitz and Byron Scott then (3:20) talk about how much attention teams pay to seeding when they head into the playoff. Chris Archer suspended 5 games Yasiel Puig 2 games. MLB.com Power Rankings after the first full week of the season. Colorado Rockies third baseman Nolan Arenado fields some ground balls with Alex Rodriguez at Coors Field and discusses (0:01) his gameday routine, (1:17) his technique as a third baseman and (2:34) what has made him such an outstanding fielder. Arenado also demonstrates how to handle some of the toughest plays he faces at third base. 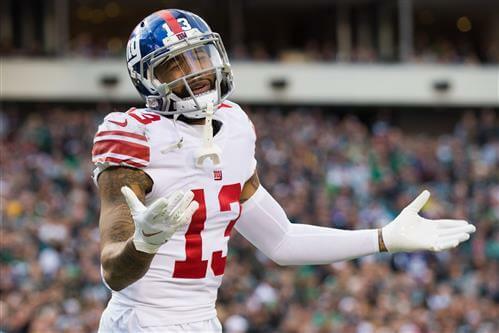 Odell Beckham Jr.’s first feeling after the Giants traded him to the Browns wasn’t relief or excitement. It was hurt. Beckham was pretty quiet after the trade, posted something on social media the next day about joining the Browns, and then opened up during his introductory presser in Cleveland. Louis Riddick joins Stephen A. Smith and Max Kellerman to try to make sense of the New York Giants’ trade of Odell Beckham Jr. to the Cleveland Browns and what it could mean for the future of head coach Pat Shurmur and general manager Dave Gettleman. Baker Mayfield defended Odell Beckham Jr. against reports that he wasn’t happy to be in Cleveland, putting his leadership on display in front of his teammates. Steve Dangle talks you through his 2019 NHL Playoff bracket. Find out who he predicts to win the 2019 Stanley Cup and how that team is going to get there. Mike Babcock opted at Monday’s practice to split up William Nylander and Auston Matthews. On Tuesday he explained his decision by saying he will move them around and play them based on their performance. Mark Masters has more. After falling short of a playoff birth, the Montreal Canadians feel that they are trending in the right direction, and believe with the new environment, they will be in he playoffs next season. Does Jack Hughes have the potential to be a 60+ assist player per year?